My doctor started it all. He started warning me about falling off my road bike. After a broken wrist and fractured elbow, I knew he was right. He recommended a trike so I could continue my 100 mile a week routine, which is, after all, very good for me. And, at the tripe old age of 77, my legs are not what they used to be, so it was time to contemplate electric assist at the same time. I had some experience with the Scorpion, but elected to get a 26-inch version with electric assist this time round. I�m simply delighted with the end-result. I�ve got about 600 miles on the Scorpion at this point, which has given me enough time to adjust to the recumbent and electric assist world. 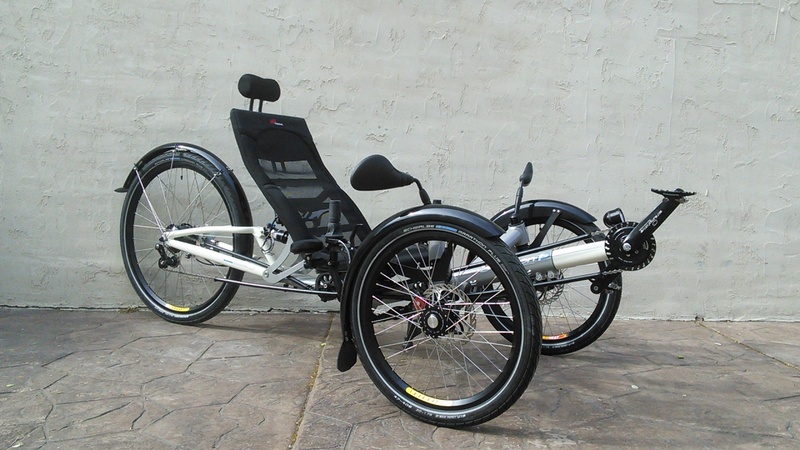 Quite apart from familiarizing oneself with the recumbent�s handling, it takes some time to get used to having electric power at the push of a control. I learned early on that it�s important to develop the right mindset. This is not, repeat not, an electric go-cart. The magic word is �assist�, for that�s what Velotechnik designed the fs-26 around. Once I realized that, I really began to enjoy myself and the enjoyment increases every time I go out on the road. This, by any standards, is a beautifully designed machine, very much aimed at the serious owner who wants to cover mileage and own his trike for a lifetime. With full suspension and a supremely comfortable ride, you can focus on the actual riding rather than the technicalities. First, the choices I made when ordering the trike. Lesson number one. Talk to Ashley. He knows of what he speaks and gave me very sound advice, some of which I, alas, initially ignored, only to make changes later on, as I learned the hard way, But that is, in the final analysis, the best way to make decisions about any bike. Lesson number two. Use clip-ons and specify those when you order. I was na�ve and did not, having had bad experiences with two-wheelers. After one exquisitely painful encounter with the pavement with my right foot, I retrofitted. Problem solved. Lesson number three, order the Schumpf High Speed Drive from the get-go. I elected for a conventional front derailleur and, after constant adjustment problems, am now retrofitting the Schumpf. Fortunately, I can ship my front boom to Utah and they�ll fit it for nothing. Finally. please get a horn. I fitted mine today and enjoyed the lovely experience of watching two pedestrians blocking a bike path leap athletically for the ditch accompanied by their dog and a bag of groceries. Any regrets? Hell no, they were on a bike path and blocking it! I ride in some heavy traffic and it�s a wonderful insurance policy. 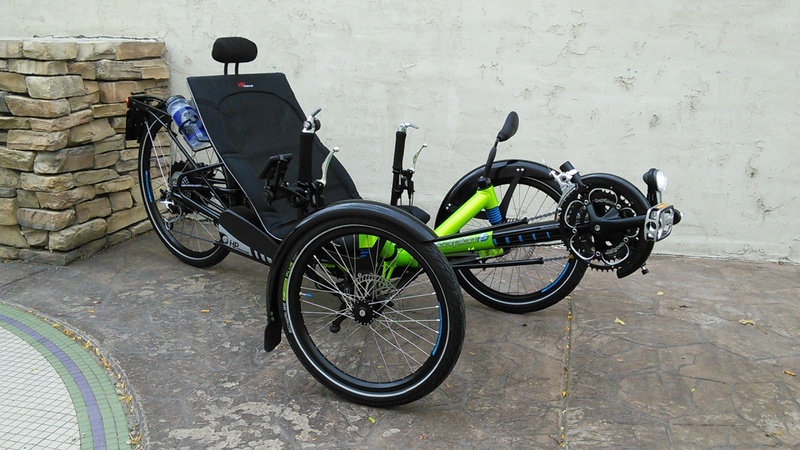 This is a trike designed for serious mileage and the electric assist makes all the difference. The ride is smooth and comfortable, the steering exquisitely precise. I�ve found that the 26-inch rear wheel makes a huge difference. The trike seems to have much better �stride�, and an ability to maintain higher cruising speeds on the level, which is, after all, where we spend a lot of our time. The art of an enjoyable ride, like a conventional trike, is to really use the gears and to use them to spin. If you do that, you can then apply electric power with a gentle push of your left finger if needed but minimally, adjusting it carefully so that you use just enough power to maintain significant resistance for a serious workout as you spin. This takes some learning when you encounter steeper hills, for the art is to get a work out without the pain of extremes�which is something that my aged legs do not appreciate. In other words, use the power when you need it as an assist, not as primary propulsion�and use the correct gear for the gradient. I learned this the hard way, when I tackled a long gradual hill in the wrong gear and the battery ran flat. Fortunately, I could retreat downhill while the battery recharged! For the most part, I use my Scorpion to get a serious workout, which means that I use the assist as little as possible. I rely on my pedal power most of the time, but electric assist gives me a critical push when I am on a long, slow hill, there is a sudden gradient, or I need a burst of speed at a moment�s notice. It�s particularly useful at traffic lights and intersections, where the name of the game is to get out of the way as quickly as possible. Just a tap on the throttle, and you�re on your way. Another advantage of the electric assist is that you can cover longer distances. Twenty miles become twenty-five or thirty when you can maintain steady average speeds by using the assist. Great fun! The handling is impeccable, both when cornering, which the Scorpion does with exquisite precision, and when going fast downhill, always a criterion with any trike. This is a very solidly built machine with no creaks and rattles to bother one, but please be aware that you�re going to be adjusting the derailleur(s) a few times while the cables stretch, but that�s true of any bike. I�d been concerned that I had slacked off because of the electric, despite spinning vigorously. Last weekend, I went on a 50-mile ride on my two-wheeler and expected to find out the hard way. To my delight, I�d lost nothing, and was indeed, if anything, fitter. I powered up a long, gradual hill for three quarters of a mile at an impressive rate, mentally blessing the miles on my Scorpion peddling hard uphill with electric assist. This is truly a superb trike and the assist makes all the difference, if you use the gears, and I mean use, and spin as hard as you can. I see a wonderful biking career looming ahead. And, of course, when I�m in my nineties I�ll probably rely more heavily on electric assist. But, what the hell, by then I�ll have earned it. Now for more miles. I�ll report back with a few thousand miles on the clock, but I�m sure I�ll be smiling and will not weigh 300 pounds!